Vancouver-based Colombian band Breaking Boundaries will join us this Canada Day to bring an authentic way of playing Vallenato and Cumbia! 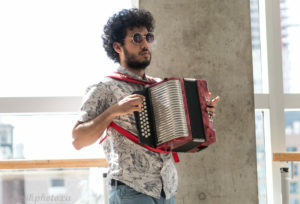 Formed in Vancouver in 2015 with the purpose of sharing Vallenato and Cumbia music, the name of Breaking Boundaries reflects one of its main purposes: to overcome generational gaps and so to share with people from all ages and backgrounds the music. It is through music and love, that Breaking Boundaries is creating a strong connection with its audience. The caja, a drum similar to a tambora, is one of the three main or traditional instruments of the Vallenato music. Caja, the slang word adopted to nickname this drum, means “box” in Spanish. 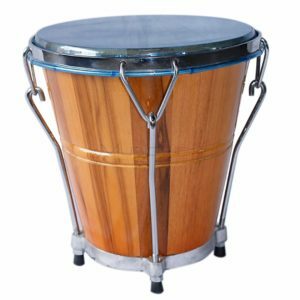 There is also a Caribbean drum called caja, used in the music of Colombia. African slaves brought by the Spanish colonizers came along with tamboras to what is now northeastern Colombia probably derived from the Congolese makuta drum. Tamboras were first adopted by the Cumbia musical genre and later introduced to Vallenato music. 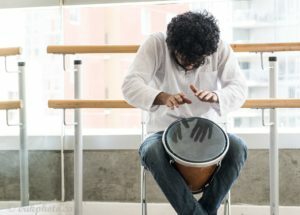 With the advancement of technology new make and models developed the traditional drum into an instrument similar in make to a conga. Traditional: Elliptic cylinder made out of wood and a cow skin (drumhead) stretched over the top wider opening and tighten with rustic ropes, approximately 30 cm (12 in) of height. Modern Version: similar in made to a congas drum but shorter in height (approximately 30 cm or 12 in). Made out of the same wood base but no ropes are used to stretch and hold the skin, instead a metal frame bolted to the wooden base is used to hold the animal skin or X-ray photo (radiograph) made skin. Vallenato has four different rhythms to which the caja adapts to mark the base key: Rubbing and strucking with hand palms. Guacharaca [ɣwatʃaˈɾaka] is a percussion instrument usually made out of the cane-like trunk of a small palm tree. The guacharaca itself consists of a tube with ridges carved into its outer surface with part of its interior hollowed out, giving it the appearance of a tiny, notched canoe. 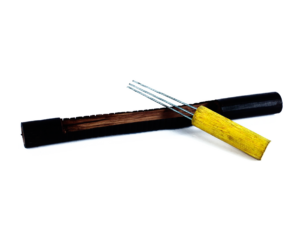 It is played with a fork composed of hard wire fixed into a wooden handle. The guacharaquero (guacharaca player) scrapes the fork along the instrument’s surface to create its characteristic scratching sound. A typical guacharaca is about as thick as a broomstick and as long as a violin. The guacharaca was invented by native American Indians from the Tairona culture in the region of la Sierra Nevada de Santa Marta, Colombia as an instrument to simulate the guacharaca (or Ortalis ruficauda) bird’s singing. During the mid 20th century it was adopted by vallenato and cumbia musicians and today it is most often associated with these musical styles. Guacharacas provide a steady rhythmic backbone for all varieties of vallenato and cumbia. CDDC2018 Performer: The Paul Tavai-Latta Polynesian Dancers & Co.